Margetts Kitchens dedicates pure design and craftsmanship to perfect the heart of your home. Our timeless in frame shaker kitchens built with passion and heritage. Warm design for a classic, character filled family home. The Brief: Mr & Mrs Clarke approached us with a desire to create a space that was to be the hub of their home. The location they had chosen for this hub boasted four exits, all leading you into a different quarter of the property. The main function of this space was to be a kitchen, with a priority of the client being a high level of quality and durability. Both clients worked within the food and drink industry and both enjoyed entertainment. Teenagers lived in the property and it was important for them to be able to enjoy the space as well . Our Design response: A central island was crafted to stand proud in the centre and enable an engaging and enjoyable experience to daily life in this busy family environment. Surrounding banks are cabinetry complementing the kitchen island, hand finished with a fine estate eggshell (Farrow & Ball; Pigeon) and finished with our polished heritage cabinet ware. 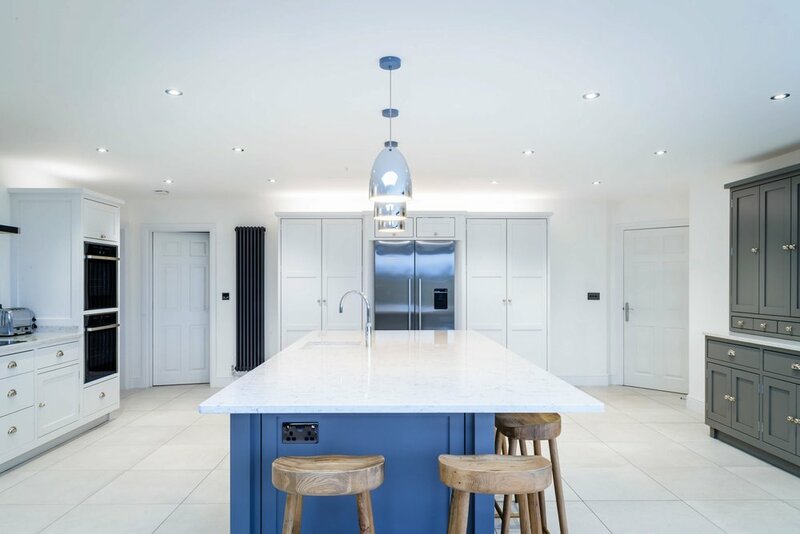 As a chef by profession, ample kitchen space was designed for prep and storage, teenagers were pulled in by the new study space and a scullery was formed for the daily family maintenance. A contemporary modern shaker kitchen, perfect to entertain. Brief: Our clients had a strong Idea on how they wanted this kitchen design to play out, expressing and interest in symmetry and geometric design with scope to store, organize and entertain. Brief: Mr & Mrs Hayes were looking for the best solution to improve areas of function within their kitchen dinner family room. Design response: A curved shaker cabinetry is always a treat for the eye, incorporating as many soft edges as possible allows a easy sense of flow between kitchen dining and the family room. With Grand children running around, our clients felt it was important to have a safe and inviting kitchen space to spend time in. Open plan, In-frame shaker kitchen. Design Brief: Create a beautiful kitchen dining room with a positive connection to outside space. With a growing family Mr & Mrs Rushworth were looking for a quality hand built kitchen to stand the test of time. Design response: With some extensive plans and ideas for their home (knocking two rooms into one) our clients needed a concept that would encompass all of their wants and needs. It was important for us to listen carefully in order to create their hand made kitchen dream. We created a light and airy room from two smaller ones, giving a sense of space and connection to the garden with bifolding doors. Classic Shaker Kitchen, Bristol blue. Design brief: The clients asked us to create a space where time with family and friends can be enhanced by a fresh and colourful kitchen, as well as ticking the practical kitchens needs. Design response: The introduction of an island into the new design for this kitchen gave our clients a space to prepare food, entertain family and friends in a comfortable and easy to use environment. The hand painted finish in farrow and ball parma grey gives the base in which to accent the stunning Bristol blue colour. The in frame shaker doors are dressed with clean lines of brushed stainless steel to give a contemporary feel. The beautiful circular nested oak chopping block and cabinet gives a real wow factor against the contrast of the suede finish Silestone kitchen worktops. Design brief: Having enjoyed living in this unique home for a few years our clients approached us looking for a complete bespoke package and felt strongly about having a kitchen designed that honoured and complimented the heritage. Design response: Our time spent designing and hand building this kitchen for our client was a true pleasure. At Margetts kitchens we always feel honoured when asked to be part of such a unique project. With clean lines and handles design we used an honest construction method for these kitchen cabinets. Selecting a teak veneer on birch ply and allowing the geometry of the edges to create contrast, enriching the bespoke character of this unique beautiful kitchen. Opening up the wall over where the breakfast bar now sits, lets the kitchen re-engage with the rest of the open plan design and pays tribute to the original intentions of the Architect ideas. Design brief: On this project our clients were after a fresh and calm feel to the design of their new bespoke contemporary kitchen. The top priority was the ability to easily prepare food in a calm environment. Design response: Small spaces require special attention… careful placement, orientation and thought for function. Careful placed cabinets and the beauty of showering a space with light, allowing it to bounce around as much as possible was the main aim here. A handle less and consealed hinge design gives door surfaces a pure and uninterrupted feel. The worktops selected here are Minerva white and offers a clean attractive surface to prepare ingredients after a busy day. Design response: With an interesting shaped space to work with we set about creating a kitchen dining family room full of charm and functionality. A 200 year old cottage for sure has it’s challenges but the trick here was to turn those challenges into charms. 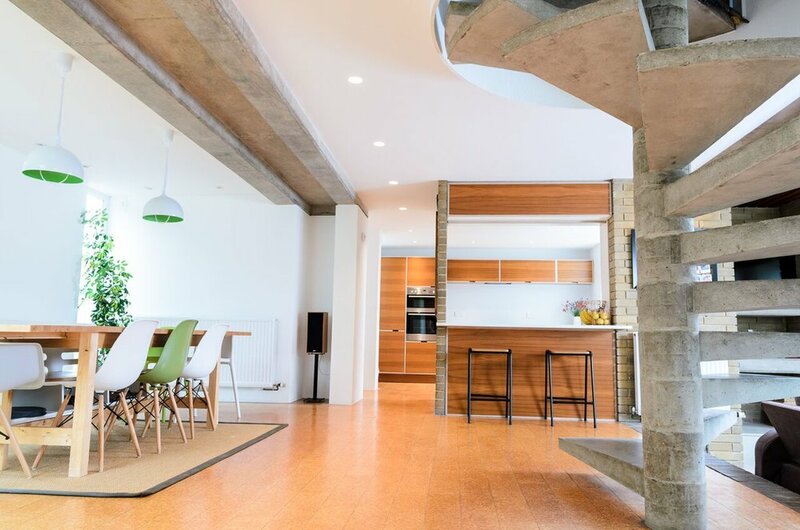 The existing laid in sections of quarry tile floor, was carefully matched to a reclaimed tile and infilled as large sections of walls were removed to achieve the open plan concept. The remaining original chimney breast warmly invites a you to a relaxed lounge off set from dining area. The galley kitchen in itself is a classic In-framed shaker but naturally complimented with contemporary style, solid oak handles and flat slab doors all adding a clean geometry to the look of the handmade cabinetry. Equipped with everything you need to comfortably entertain family and friends including a dry food pantry. 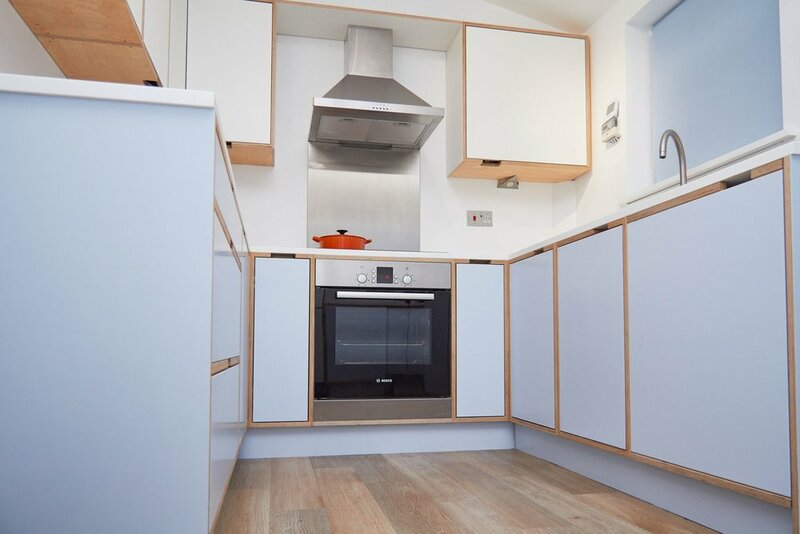 The main elevation boasts an integrated Caple Sense Oven and Sense microwave and to the right a large cuttery drawer with two pan drawers below. Above this the 4 zone induction hob is set into a piece of stunning Nile Carrara Quartz bridging over the intergraded dishwasher and along to the circular ceramic under mount sink. A fully intergraded fridge freezer on the far right takes care of the cold food storage. The opposite bank of kitchen units allows additional storage and prep space while a view from the window can be enjoyed into the fairy tale garden. Traditional shaker packed full of character and delight. Design brief: To create a cottage style kitchen with lots of features to including mock chimney and island. Design Response: As with all of our Clients we actively make a list of every thing one may wish to include in their dream kitchen and do our upmost to build this list into the design work. We feel Wasdale house is a fantastic example of this, with a reclaimed oak beam set into the mock chimney over the range master to the double ceramic Villeroy & Boch Butler 90 sink this kitchen certainly oozes functionality and charm. The timeless in-frame shaker kitchen with a tailored hand painted finish insures the sustainable life time of cabinetry, colour trends come and go and as with the beauty of our hand painted kitchens they can be refreshed or colour changed with ease. The room was laid with Dijon Tumbled Limestone which really sets a stunning platform to which this kitchens in set. The soft tones and natural colour pallet of the stone offers a beautiful contrast against the two tone paints of the bespoke handmade cabinetry dressed with stunning chrome handles and cups.